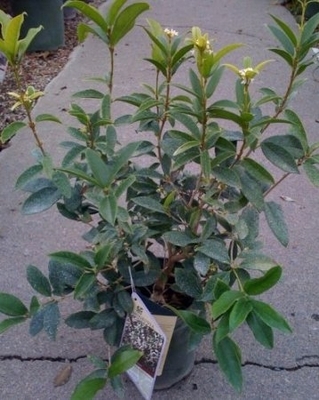 Osmanthus fragrans, also called Sweet Olive, is an evergreen shrub with extremely sweet smelling blossoms. This plant is a moderate grower to about 8 to 10 feet or easily clipped shorter. The flowers are tiny and white with a delightful apricot like fragrance. The osmanthus blooms heaviest in the spring and early summer, and off and on throughout the season in milder climates. Plant your sweet olive plant in full sun to partial shade. This easy care evergreen is not picky...average soil and water is just fine. This sweet smelling treat for your garden is hardy to USDA zone 8 and all higher zones. Shipped potted in soil to ensure the best possible start when planted in yard or garden. Please allow up to 1 week for this item to ship out as we bring it in directly from our grower.